This yellow rice recipe is simple to make and super delicious! It turns out beautifully golden and very fragrant. While yellow rice is often made with saffron, it can easily be made with turmeric instead, a spice which has incredible health benefits (in Thailand, turmeric is known as "poor man's saffron"). 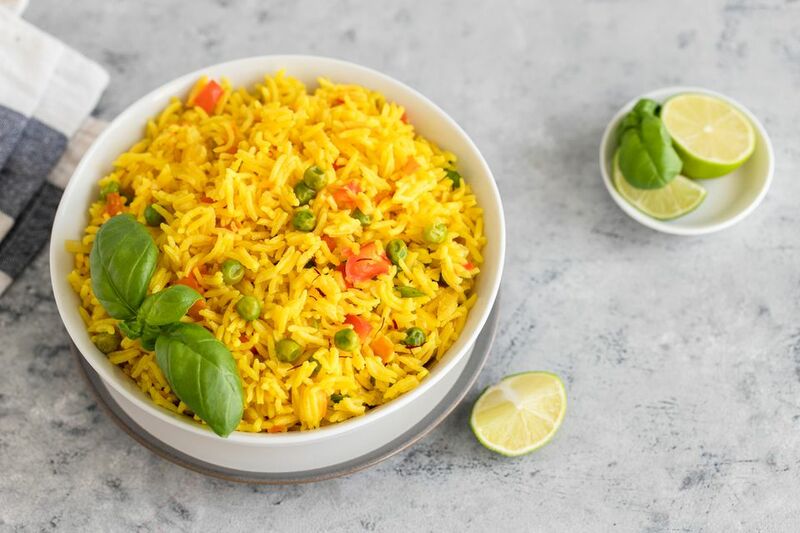 Yellow rice can be found across a number of cultures, including Thailand and India, and is a wonderful companion for curries of all kinds as well as seafood, fish, and chicken dishes. This also makes a nice side dish for any meal—a perfect potluck addition! White Thai jasmine rice or Indian basmati works well in this dish, or you can use any long-grain white rice. This recipe includes tomato, but if you'd like to omit it, just increase the stock to the full 4 cups since the tomato adds liquid to the rice mixture. Set a deep pot over medium-high heat. Add the oil and swirl around. Then add the onion, garlic, and chili. Stir-fry to release the fragrance - about 1 minute. Next add the red pepper and tomato. Stir-fry 1 more minute. Then pour in the stock and turn heat to high. Add the lime juice, fish sauce, turmeric, and saffron (if using). Stir well. When the stock begins to bubble, cover tightly with a lid and reduce heat to low. Let rice cook 15 to 20 minutes, or until all or most of the liquid has been absorbed. Remove the lid and fold in the peas, giving the rice a gentle stir as you do so. Replace the lid and leave the rice to sit over the same hot burner (with the heat off) for at least 10 minutes, or until you're ready to eat. The residual heat inside the pot will help any remaining liquid absorb and finish cooking the rice; it will also nicely cook the frozen peas. Rice will stay warm in this way for 1 hour or more (great for making ahead of time). Remove the lid and fluff rice with fork or chopsticks. Taste, adding a sprinkling of salt if needed. Top with a little fresh basil.